The Quinnipiac men’s ice hockey team defeated the Princeton Tigers, 3-2, Sunday at High Point Solutions Rink at TD Banks Sports Center. Zack Currie carried the offense with a pair of goals and Scott Zurevinski and Yuri Bouharevich both added assists to extend their point streaks to five games. Goaltender Eric Hartzell made 36 saves for the win and the game was the eighth straight start for Hartzell in which he allowed two or fewer goals. 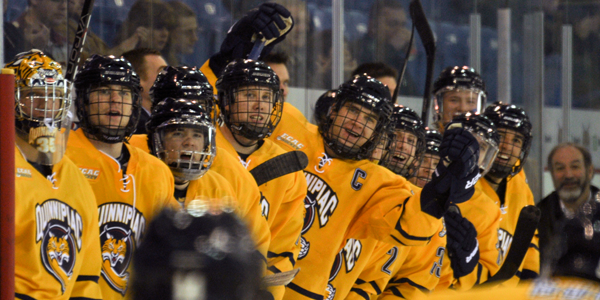 “He played well enough to win today and made some key saves on power plays,” Quinnipiac head coach Rand Pecknold said. Quinnipiac (11-6-3, 3-4-3 ECAC) gained the upper hand on the scoring opportunities early with a pair of power plays just under eight minutes into the game. The Bobcats converted on one of their opportunities when Currie put the puck on net from the right point through a screen past Princeton goaltender Mike Condon. Bouharevich and Clay Harvey both recorded an assist. Two goals separated by 1:14 of play broke the game open for the Bobcats in the second period. With top offensive players Jeremy Langlois, Connor Jones and Kellen Jones out of the lineup the team needed other players to step up. One of these players was Kevin Bui, who scored his first career goal at 4:45 of the period to give the Bobcats a 2-0 lead. Bui forced a turnover in the neutral zone and broke towards the net on an odd man rush with Reese Rolheiser. Condon denied the initial opportunity but the save forced him out of position and Bui put the rebound into an open net for the goal. Currie scored the second of the two quick strikes to give Quinnipiac a 3-0 lead. Currie received a pass at the point from Russell Goodman and ripped a shot through a screen for his second of the game. Zurevinski also was credited with an assist on the play. The Tigers (4-9-2, 3-7-1) swung momentum back over to their side with a pair of late power plays of their own, but key saves by goaltender Hartzell kept the lead in tact for Quinnipiac. Princeton took ownership of the puck and controlled the offensive zone play in the third period especially late in the game. Princeton defenseman Michael Sdao finally beat Hartzell at the 15:19 mark of the third period to cut the Bobcats lead to 3-1. Continuing to control play in the offensive zone, Princeton pulled Condon for an extra attacker with just under three minutes to play. With just over a minute to play Andrew Calof one-timed a shot passed Hartzell from inside the face-off circle to bring the Tigers within a goal of tying the game. However, the Bobcats held off Princeton in the final 1:08 of the game and won, 3-2. The Bobcats’ next game is on Dec. 30 when the team heads to Nebraska-Omaha for a weekend set against the Mavericks.